Today Reach Academy Feltham and East London Arts and Music announced a partnership to broaden the access to an exceptional music education for young people in London. 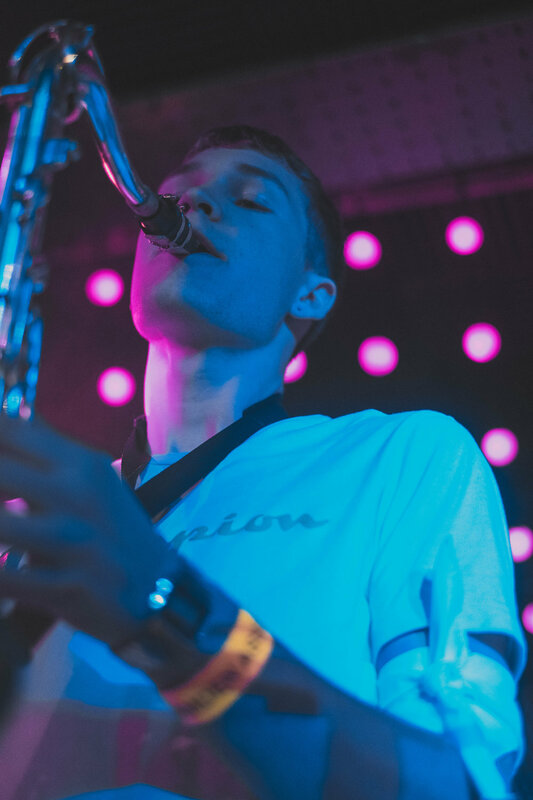 From September 2019 , Reach will be delivering ELAM’s innovative Extended Diploma in Music, a course which has rapidly developed a reputation as the industry standard course. ELAM will share their curriculum and train and develop the Reach music teachers, while giving Reach students access to the wide range of opportunities that their trainees enjoy. The collaboration comes at a time when music education is struggling, with the BPI reporting a 21% decrease in music provision in state schools over the past five years and a worrying decline in music in schools serving vulnerable communities. ELAM, which opened in 2014, was set up to address the abundant support of young creative talent across East London and the growing demand within the UK’s creative sector. The collaboration will increase access to ELAM’s approach. Principal Charlie Kennard said: “ELAM is getting 500 applications a year for 75 places in Music and we are having to turn away a lot of talented musicians with great potential. Working with Reach, in another part of London, is a pilot that could become the way we provide more young people with this experience”. Students interested in the course should visit https://www.reachacademysixthform.com/ for more information. For more information or to arrange an interview, email ed.vainker@reachacademy.org.uk or ckennard@elam.co.uk. Stormzy delivered a masterclass alongside Mo the Comedian this week, in partnership with Adidas on the theme of using your community. We gave him a little glimpse of the future MCs coming through to take his throne. We officially opened our Innovation Lab on Wednesday 12th September. The Innovation Lab which has been developed in partnership with YouTube contains green-screen facilities for visual effects and motion capture, with a multi-camera vision mixer setup and dynamic studio lighting utilising 360 degree camera technology. All this impressive kit will allow us to create some truly groundbreaking content which is what we do best. 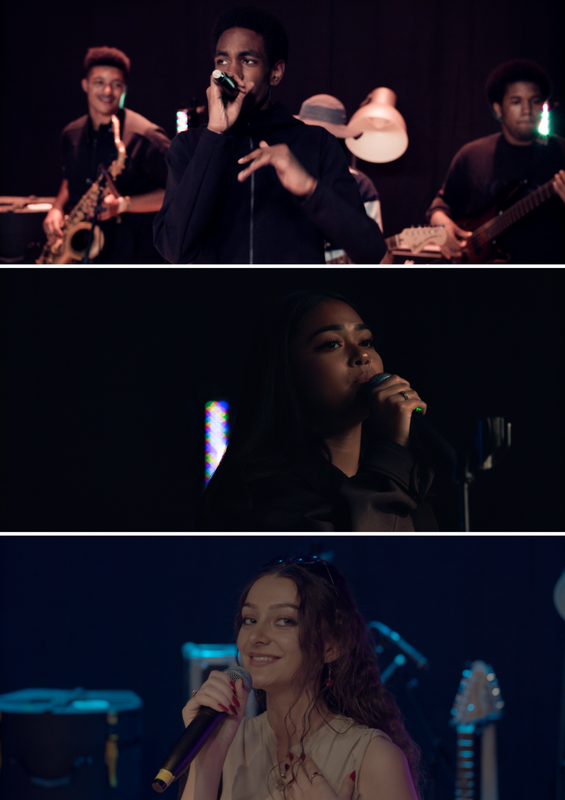 ELAM Alumni Shireen, Ezria, RASiDA and Y.P all performed on the launch. ‘Battle of Nature’s Finest’ An awesome 3D Tower Defence game where you can save the world!! On a planet where fruit inhabit the lands and are ruled peacefully by the Giant Pumpkin King, they must protect their kingdom against the vengeful vegetables who are out to destroy that peace. You control. You protect. Battle of Nature’s Finest: Fruit vs Veg or BNF: FvsV for short is a 3D Top Down Tower Defence game where you control the battle between the Nature’s Finest. In an array of stages, you will battle to protect various lands within the kingdom of the fruits and stop the vegetables from passing through, using your many fruity troops, each with their own unique personalities. The game is currently in its beta stage after 6 weeks and the developers are planning on adding a lot more to it in the coming week. Including new Bosses, extra levels and possibly more recruits to the ranks. This is a game anyone can play anywhere and will no doubt prove to be a hit. The game after a web release will be continuously worked on for a later mobile release. Watch this Space. Fresh Labs is an Independent company working in game development, they are only a few months old but hope to get our name out there by producing awesome games like Battle of Nature’s Finest' and more. Restore music back into the world as you dive into the world of 'Lost melody'. Queen and Bowie are singing a duet in concert when suddenly they are transported into a dull world where music does not exist. Join the duo on their adventure as they begin their journey in order to regain colour into a world so dark. Due to captivating and addictive gameplay. Players can enjoy their time playing as Queen, with the help of Bowie as her companion as they put on live concerts. However, the duo must fend off against dark forces that want to top Bowie’s and Queen's attempt to bring music and joy back into the world. The game currently has 2 playable and repayable levels with a variety of musical tracks to accompany them. The player must also fend off the enemies to the beat of the music, making audio an essential part of gameplay. You can also follow the development of the game by following Islam Dallali’s twitter account where he will be documenting new updates about the game. You can follow him using this link. You can also follow Blade Studios, a games studio that Islam Dallali and Saikumar, another ELAM trainee have started with this link to follow any updates in what we could be making next. As part of the global Start the Change Programme, Rochelle Robertson our Pastoral lead has been working with some ELAM trainees over the past few months to produce a podcast that is inspired by critical thinking. In each episode, they discuss a matter important to young people for which they research, discuss stats, and bring their personal experiences to the conversation. Our first episode is about Student Mental Health and features Grace Seal, Olivia Allen, Kieran Lewis and is hosted by Blessing Borode, and our special guest, ELAM Maths teacher Adam Dawalty. Special thanks to CK, Elijah and Daniel Giddy, who have been working super hard behind the scenes, on social media, research, and talent co-ordination. 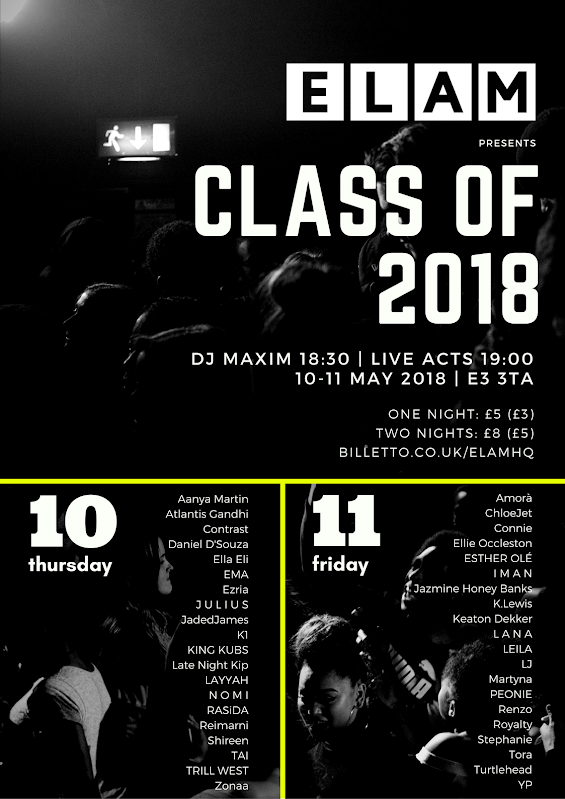 It's with great pride (and a tinge of sadness) we send off our majestic 2016-18 cohort with their spectacular two-night Class of 2018 festival. Tickets are available on our events page. ELAM's Year 12 Music students will be playing their next show at RichMix, an incredibly famous venue in London. The show will consist of 'old greats' performed by the future leaders of the Music Industry. Their last show was at Camden Assembly, another massive venue in London's music scene and it proved to be a huge success. The trainees have been rehearsing tirelessly behind the scenes for this event and are relishing the opportunity to perform for everyone. There are still tickets available and they can be purchased below.